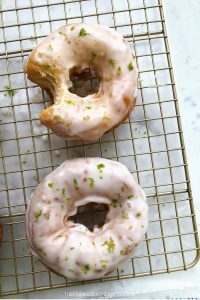 These margarita-glazed doughnuts are a fun recipe to impress your adult guests for breakfast or brunch—it’s like having a cocktail for breakfast without the buzz! If you’ve been a longtime reader, then you know we love biscuit doughnuts in our house! They’re super easy to make, and the icing only takes a few minutes to whisk together. 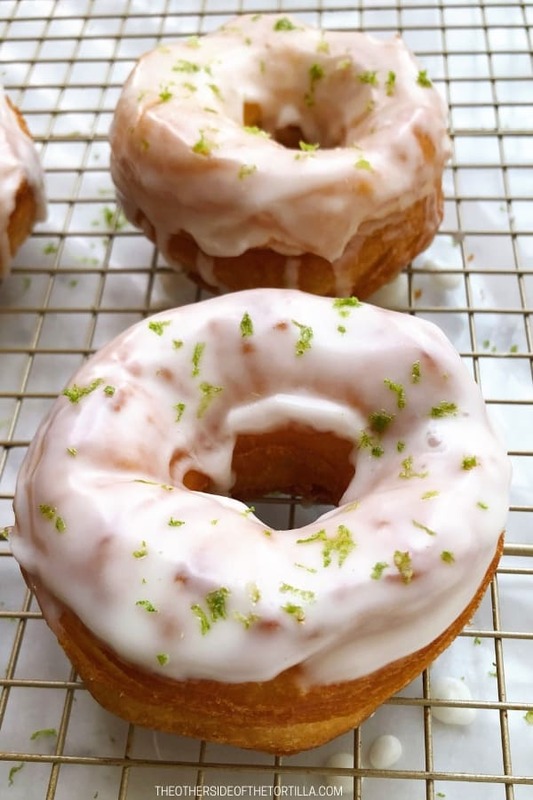 A couple of bakeries in LA have a margarita-glazed doughnut that I really liked, so I thought I’d try making my own at home and these were pretty spectacular! The icing really does taste like a margarita. I’ve previously shared a recipe here for hibiscus-glazed doughnuts and Mexican chocolate-glazed doughnuts, and these follow the same method of using Pillsbury Grands original flaky biscuit dough. This makes for super-fluffy and light doughnuts. Please note this recipe is for adults only, as the glaze contains a little bit of tequila and Cointreau. The key ingredient that makes the glaze is using Mexican lime juice to give it that bright, acidic touch, and a little bit of zest for garnishing. If you can’t find fresh Mexican limes or key limes, you can substitute regular lime juice and zest, though it won’t taste exactly the same. I don’t recommend using bottled lime juice under any circumstances; fresh is always best. Whichever type of limes you use, you’ll need a microplane grater for getting fine citrus zest. To make for easier clean-up, I also like to line a baking sheet with parchment or wax paper and place the cooling rack over it, then dip the doughnuts in the icing and let it sit on the cooling rack and drip-dry. Just toss the parchment or wax paper when done! A word on whether or not to reheat biscuit doughnuts: Don’t. They’re great when they come straight out of the frying pan once the glaze is dried, but they don’t taste the same reheated (plus the icing can run when reheated). If you won’t make them all at once, separate the dough and refrigerate what you won’t eat right away. It’s easy to store leftover glaze, and that will taste fine the second day. Just cover with plastic wrap and put it in the refrigerator, too. Bring to room temperature when you’re ready to glaze a fresh batch. 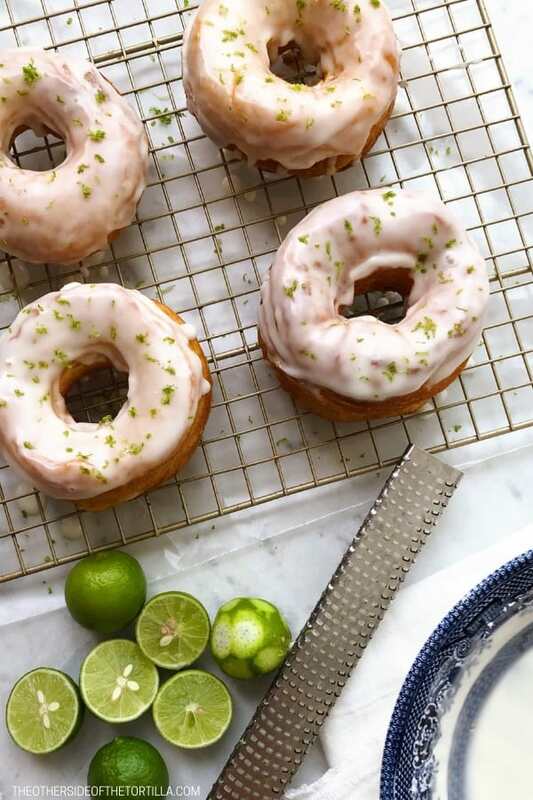 Margarita-glazed doughnuts made with Pillsbury flaky biscuit dough are an easy and decadent treat you can serve to any crowd for breakfast or brunch. Pour about 1 inch deep of canola oil into your pan. Heat over medium to bring the oil to temperature. Remove the biscuits from the packaging and place them on a parchment paper-lined cookie sheet. Use a small circular cookie cutter or a small juice glass to cut circles out of the middle of the biscuits. You should have 8 doughnuts and 8 doughnut holes. When the oil is ready, it should bubble or pop very slightly. You can test its readiness with one of the doughnut holes if you’re not sure. The dough should start frying immediately after touching the oil. Add the doughnuts to the oil 3-4 at a time and fry for a minute or two, until the dough starts to turn golden. Flip them gently with a wooden spoon or tongs. When they’re done frying, remove from the oil and place them on a paper towel-lined dish to drain any remaining oil. Repeat with the remaining doughnuts. 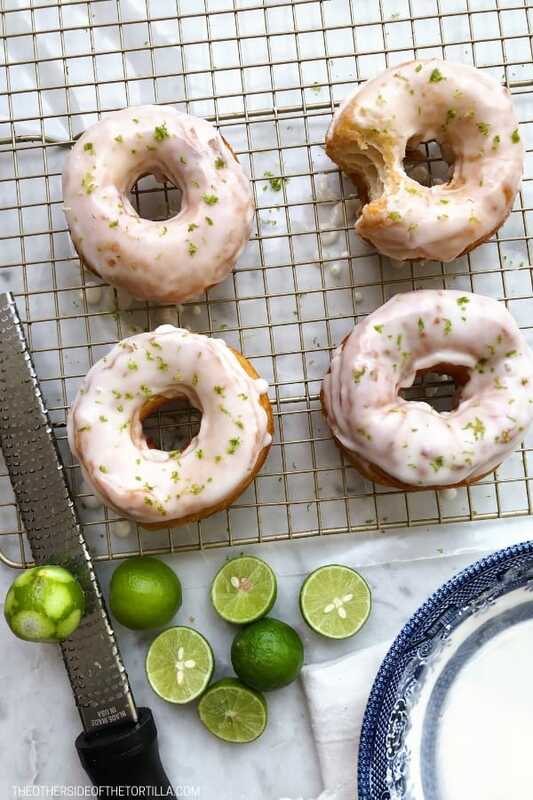 While the doughnuts are cooling off and draining excess oil, add 1-1/4 cup powdered sugar, 2 tablespoons key lime juice, 1 teaspoon tequila, 1/2 teaspoon Cointreau and 1 teaspoon heavy whipping cream to a shallow bowl. Stir or whisk the mixture until completely smooth. The glaze should be thick and not too transparent. Dip the tops of the doughnuts in the icing, twisting them slightly to ensure they’re coated evenly all the way around the tops. Place them on the parchment paper-lined baking sheet to dry. I like to dip mine twice to get an opaque icing look. Garnish with lime zest and serve.